At Streeter Associates, our best asset is our team of people. For nearly seventy years, Streeter Associates has built a reputation of handpicking the region's best construction professionals to join its team. The result of this pursuit is a company with a commitment to integrity and unsurpassed business practices which is evident with client relationships spanning Streeter Associates' seven decade history, including Arnot Ogden Medical Center, Cornell University and Elmira College. Every member of the Streeter team is knowledgeable and professional. This level of professionalism is expected of every subcontracting partner. Through our industry relationships with construction trade organizations such as Associated General Contractors of America (AGC) and regional construction industry exchanges, our company has gained valuable insight into construction issues and trends. Additionally, we have used the same insurance company, banking institution, and accounting firm since our inception. Streeter Associates would value the opportunity to discuss professional construction services with your company. Whether it's renovating an existing building or constructing a new building, we have the expertise and manpower to help you achieve your goals. Before joining Streeter Associates, Jeff graduated from St. Lawrence University in 1990 with a Bachelors degree in Sociology. Upon graduation he worked for Streeter Associates and CNF Constructors before attending the Pennsylvania State University. He graduated in 1995 with a Bachelors degree in Structural Design and Construction Engineering Technology. He rejoined Streeter Associates in June 1995 as an Assistant Project Manager. He later worked as a Project Estimator and Project Manager before becoming Vice President in charge of Project Management in 2000. Jeff is currently the President of Streeter Associates, Inc., a position he has held since 2002. In the community, Jeff is currenly on the Board of Directors for GBC (General Building Contractors of NYS), STEG (Southern Tier Economic Growth), COEM (Center for Occupational & Environmental Medicine) and the Cheumung County Chamber of Commerce. Jeff has also served on the Board of Directors for the Chemung County YMCA as the Past President. Rob graduated from Corning Community College in 1985 with an Associates Degree in Business Administration. Upon graduation he joined Louis Picciano Sr. Corporation as an Assistant Project Manager. In 1989 Rob went to work for Keuka Construction Corporation as an Estimator and Project Manager. In 1994, he joined Streeter Associates Inc. as a Project Estimator. He was promoted to Senior Estimator in 2000 before shifting to the Project Management Department in 2002. After successfully managing some of Streeter's most challenging projects, Rob was promoted to Vice President in charge of Project Management in 2004. Rob is an active member of the Chemung County Planning Board. Don started working in the construction industry in 1984. In 1987 he graduated from Delhi College of Technology with an AAS in Building Construction. He worked for John F. Judski, Inc. and for Burton-Markoff Construction, Inc., prior to joining Streeter Associates Inc. in 1994 as an Estimator. He has been involved with all types of estimating from conceptual budgeting to "hard bids". In 1997 he was promoted to Senior Estimator. His duties have included preparation of detailed cost estimates, competitive bids, development of budgets, negotiation of subcontracts, project scheduling and pre-construction services for negotiated projects. Don was promoted to Vice President of Estimating in 2004. John Manning joined Streeter Associates in March of 2018 as Controller. John is a graduate of Southside High School and LeMoyne College and is a Certified Public Accountant. John brings over 25 years of professional, leadership and executive experience across several industries to the company. Prior to joining Streeter Associates, John was the Finance Manager at Chemung Supply Corporation, Talisman Energy USA and General Manager of QVF Process Systems Inc. John is grateful for all the terrific opportunities, challenges, professional growth and fantastic people he has had the opportunity to work with. John looks forward to continuing this tradition with Streeter Associates and the regional community. John enjoys spending time with family and friends and spends his free time enjoying the Finger Lakes and many outdoor activities. Ken Brenza has been in the construction industry for nearly 40 years. Ken started his career as a carpenter's apprentice and then progress from being a carpenter journeyman, foreman, superintendent to a project manager, joining Streeter Associates in 1988. During his tenure at Streeter Associates, Ken developed an expertise in healthcare construction and refined his skills as an Estimator and Project Manager. His versatility as a "hands-on" person and as a strategic thinker has allowed Ken to perform multiple roles for the company and oversee a number of significant projects. In 2012, Ken was promoted to General Superintendent. In this role, Ken manages Streeter Associates' field supervision and tradespeople as well as monitors quality control. Jim started his career as a carpenter in a family run business working through high school and college. After moving west in 1975 to work for Kiefer Construction as a carpenter and engineer in San Francisco, California he returned in 1977to work as a carpenter foreman /superintendent for Valley Builders in Binghamton, NY. From 1979-1994 Jim owned and operated Penwell Solar Homes in Binghamton, NY. In 1994 he joined Streeter Associates Inc. as an Estimator and then moved onto the positions of Field Engineer, Superintendent, and Project Manager. Jim has been the Manager of the Butler Division since 1997. Rob started working for Streeter Associates in 2010 and is a 1991 graduate of Rochester Institute of Technology with a Bacholer's degree in Photographic Illustration and Design. In the decade that followed, Rob was a commercial photographer with a client roster that included Eastman Kodak, Xerox, and DuPont. In 2002, Rob joined family-owned Stanton Direct Marketing where he was Vice-President of Business Development. While at Stanton Direct, Rob developed and managed accounts with companies such as Overstock.com, OfficeMax, and FranklinCovey. From 2006 to 2010 Rob served as Co-Chair of the Direct Marketing Association's Insert Media Council. Rob is currently the Committee Chair for the Children's Miracle Network Annual Golf Tournament Fundraiser (Arnot Foundation), On the Board of Directors for United Way of the Southern Tier and a committee member for the Chemung County Chamber of Commerce's Leadership Chemung program. The Streeter family traces its’ construction roots to the early part of the century with Streeter Construction Services, owned by Arthur Streeter. Arthur’s son Henry operated his own company from the great depression through the end of the 40’s before joining forces with his brother Charles and officially incorporating Streeter Associates on June 13th, 1949. Classy and well-mannered, Henry Streeter, Sr. set the tone for what would become one of the most well-respected family businesses in the region. During the 1950s, the company planned for the succession of Henry by bringing in a partner, James A. “Big Jim” Norris. Led by the financial acumen of Charles M. Streeter, Sr. and the construction expertise of “Big Jim” Norris, Streeter developed a business model based on providing the highest quality of construction services with the goal of creating satisfied customers and repeat business. It was at that time that they planted the seeds for future long term relationships with Arnot Ogden Medical Center, Hardinge Inc., Westinghouse, Elmira College and Cornell University. In the 1960s, a second generation Streeter and Norris joined the firm. James A. Norris, Jr. and Charles M. Streeter, Jr. participated heavily in the growth of regional schools with buildings for Elmira City School District, Ithaca City School District, and the Horseheads School District. The company continued to develop an excellence in educational construction, continuing relationships with Elmira College and Cornell University while also developing new relationships with Ithaca College and Corning Community College. The company also continued developing an expertise with manufacturing construction working for existing customers like Hardinge Inc. while establishing new relationships with companies such as Corning Glass. After the expansion of services during the 1970's, Streeter continued steady growth in the 1980's, expanding its' customer base, work force and offices to stay ahead of the growing demands of the industry. Charles M. Streeter, Jr. became President in 1987 and with his doctrine of "management with integrity," the company continued to expand its' services, customer base and geographic reach. Industry, Arts, Healthcare During the 1980s Streeter continued serving the needs of the region, proudly participated in the expansions of the Bath VA Hospital, Toshiba Display Devices, Hardinge Inc., Corning Incorporated, Taylor Packing Company, Arnot Mall, Rockwell Museum and Arnot Art Museum. Additionally, Streeter developed an expertise at constructing Skilled Nursing Facilities for customers such as the Ithaca Reconstruction Home, Schuyler Memorial Hospital and Ira Davenport Hospital. Since its' inception in 1949, Streeter Associates always managed growth and change extremely well while keeping true to its mission to provide the best possible construction services resulting in satisfied customers, long term relationships and repeat business. The 1990s were no exception as Charlie Streeter managed growth and changes to the company by promoting John Carpenter to Executive Vice President and Roland Grap to Vice President. Additionally, Charlie's son Jeff joined the company to carry the "Streeter Values" into the new millennium. Streeter continued their relationship with valued customers such as the Arnot Ogden Medical Center, Elmira College, Cornell University and Corning Incorporated while forging new relationships with Oswego Health to build several health care facilities and Adelphia Cable and Orthstar Enterprises to build new corporate headquarters. In 2002, Jeff Streeter was promoted to President and continued to nurture Streeter Associates' longstanding relationships with major expansions for the Arnot Ogden Medical Center and Elmira College, as well as multiple projects for Adelphia Cable, Cornell University and Corning Incorporated. Jeff progressed in building a team of key people based on his vision for the company's future, starting with the promotion of Scott Proudfoot in 2002 to Corporate Treasurer and Secretary. Then In 2004, Jeff promoted Rob Lewis to VP, Project Management and Don Rottmann to VP, Estimating. Rob and Don joined Scott Proudfoot and Roland Grap to create a dynamic management team. With a seasoned and energized team, Streeter Associates refined its objective to pursue quality projects with quality clients. While Streeter Associates continued to work on several noteworthy projects for continuing clients such as the Arnot Ogden Medical Center Schweizer Pavilion, Elmira College Meier Hall and Corning Incorporated Diesel Plant, theyalso constructed other noteworthy projects in the area such as the Elmira Country Club and the Clemens Center Performing Arts Expansion. Streeter Associates has been operating the Southern Tier of New York State and the Northern Tier of Pennsylvania since our inception. 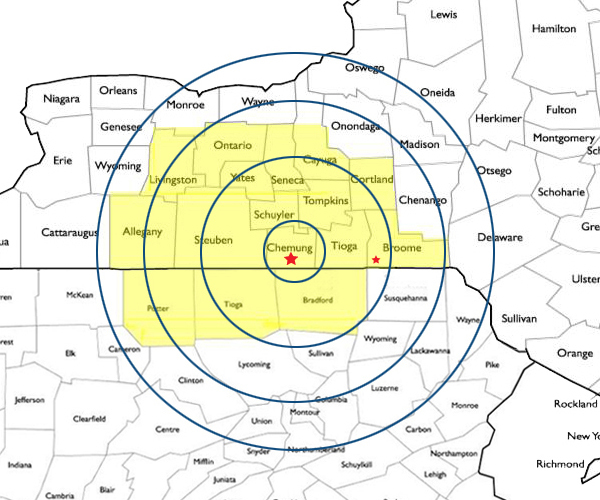 Our main office is in Elmira, New York with a satellite office in Vestal, New York. We have successfully performed a multitude of projects in this region and some at distances beyond our typical reach. We know the local supplier and subcontracting market well and are very proud to see the results of our effort serve the communities we call home. Streeter Associates' commitment to safety starts at the top. All upper management, Project Managers, Project Estimators and Superintendents attend regular company-wide safety meetings. We have a comprehensive on-going safety and health program that is designed to provide an accident-free and illness-free work environment by conducting safety and health training, hazard communication training, weekly on-site "Tool Box" safety meetings and OSHA Construction Safety Programs. As Construction Manager, Streeter Associates, Inc. conducts a "Pre-Job Safety and Hazard Communication Contractor Review" as well as joint "Safety Audits" with all site contractors. This enables us to demonstrate our commitment to safety, review the contractors' commitment to safety, and build a cooperative relationship. All Streeter Associates employees are subject to a mandatory drug-testing policy to ensure that our personnel are making clear and prudent decisions at all times. In a number of cases, we may require our sub-contracting partners to conduct similar testing with their teams as a part of the pre-construction process. Streeter Associates utilizes the services of Lovell Safety Management, having been a member of Safety Group 469 since 1956. As a result, Streeter Associates has access to Lovell's safety service through direct contact with their staff and professionals. Streeter Associates has a comprehensive and on-going safety and health program committed to providing an accident-free work environment for all employees. We conduct Safety and Health Training, Weekly Tool Box Talks, and OSHA 30 Hour Construction and Health Training Programs on an annual basis. Our Project Managers and Superintendents are well versed in OSHA's Standards for Construction 29 CFR1926. Every Streeter Associates employee is subject to random substance abuse testing to ensure that workers are alert and prudent with their actions. Every project starts with a pre-job safety review and regular safety audits. Our excellent safety record has garnered the attention of many of our customers who wisely choose to make that a part of their contractor pre-qualification process. Bob started his construction career in 1999 as a member of the Carpenter's Union and completed a four year apprenticeship and continued to work as a carpenter on numerous projects. In 2008, Bob joined LeChase Construction as a Project Engineer and worked as a Regional Safety Representative and Quality Champion in the Southern Tier of New York. In addition to his primary responsibility of overseeing safety in his assigned region, Bob also assisted with project estimating and management when needed. Bob joined Streeter Associates in October of 2010 as Corporate Safety Director to continue the company's established safety program. Review subcontractor safety qualifications and safety programs prior to subcontractor bidding during the pre-qualification process. Prepare project specific safety plan. Review subcontractor's project specific safety plans prior to allowing subs to work on the site. Participate in and conduct job site safety meetings. Participate in and conduct job site safety inspections. Research and review potentially complicated installation procedures that have safety concerns (when applicable). Review all incident, accident, near miss and inspection reports. Correspond with Lovell Safety Group for regular inspections. Provide written correspondence to subcontractors when necessary. Years before the creation of the US Green Building Council (USGBC) in 1998, Streeter Associates would often provide building performance studies for its customers, focusing on material life cycles, potential energy savings, and overall building performance improvements. As the Green Building movement evolved, the USGBC began establishing criteria for LEED (Leadership in Energy and Environmental Design) certified buildings, of which Streeter Associates has built several. Streeter is a member of the USGBC, and has several employees who maintain individual memberships in the upstate New York chapter of the USGBC. Management of the company regularly attends and encourages participation in various USGBC meetings and training sessions not only to keep up with the trends and changes, but also to provide vital input to the cause. This experience and training enables Streeter Associates to be a vital team member in the pursuit of "building green." "SAI put together a team of professional construction managers whose collective knowledge and experience delivered our project on time and under budget." "Streeter's expert and friendly staff is a testament to their operating style, and we remain prepared to support their surety bond needs in the future. "